1948 11/24 Burley Bowl football program Appalachain State vs West Chester. Ex; clean front & back; spine wear. I wrote "The Collectors Guide to Sports Illustrated and Sports Publications" Phil Regli (Beckett) and have been in the sports hobby for 40 years. If you have a question regarding your collection - please drop me a note. I update this every week with new material from my warehouse of 200,000 items. Please let me know what you collect and I will put that into the store. Grading: NM- is near mint, - means really clean copy with nice spine, surface - no creases, bends or breaks. EM - is exmt - means it is a clean copy but will have a flaw like a small crease, bends or spine breaks. However it is in nice shape. Ex - will have a significant flaw. Vg- rather flawed; gd - really flawed. 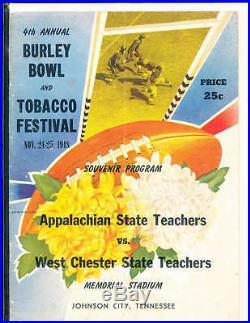 The item "1948 11/24 Burley Bowl football program Appalachain State vs West Chester" is in sale since Monday, October 17, 2016. This item is in the category "Sports Mem, Cards & Fan Shop\Vintage Sports Memorabilia\Publications\Programs\Other Vintage Sports Programs". The seller is "wwwprpsportscom" and is located in Round Rock, TX. This item can be shipped to United States.